This song is written for the crafters out there. The people who take ordinary, run of the mill things and make something beautiful and soul felt. The inspiration for this piece struck at the Museum of East Anglian Life in Stowmarket where I visited a patchwork quilt exhibition. Underneath each patchwork was written the name of the town in which it was made. There were no individual names and no way of finding out who's handiwork had created the beauty in the design. I began to think about the reasons we are remembered and the legacy we leave behind us. Most of us are not written about or published in the history books. Women even less than men, certainly up until now. I'm also not sure that I trust the gatekeepers of the written word, to commemorate either honestly or judicially. But I like beautiful things, and I am fascinated by the history embodied within the clothes, trinkets and objects that survive the years and ages. In 'Women of History' I write about women being 'lost to the pages of time' and how their stories are sewn into the fabrics that they stitched. I speak of sitting at my mother's feet as she spun wool on an antique spinning wheel. I am one of four children and we were each given a drop spindle to create our own thread. This is torture for children! The spindle would drop and the thread would break so that mum was forever stopping her spinning to reattach our thread and start us off again. I remember that mum would tell us stories. She retold one of these on a family holiday many years later; four teenagers sat around while she relaid 'Billy Goats Gruff' with all of the voices I remember. Family stories are oral, fallible and priceless. This is the gold of life. The soul to life. It's not likely to find space on the written page or within a bound book. But it forms the flesh of my song and the joy of everyday existence. I am aware that the freedoms to choose and to simply 'be' were hard won by people who had few choices and freedoms themselves. We walk in their footsteps and bask in the sun that they made rise. Some of these people are recorded, countless more are found in our genealogies and attics and within the things that they have made by hands worn raw. As much as this song is written to remember women; I have noticed that it is husbands, brothers, fathers who come up at gigs to tell me about the wonderful women in their lives who create beautiful things and leave their mark. So for those who create: sewing; weaving; whittling; throwing and countless other crafts. This song is a monument. It is recorded. Not in a history book, but if I leave nothing else behind, they can find us in the invisible grooves of the CD and in the sounds echoing through the ages. These women make history. 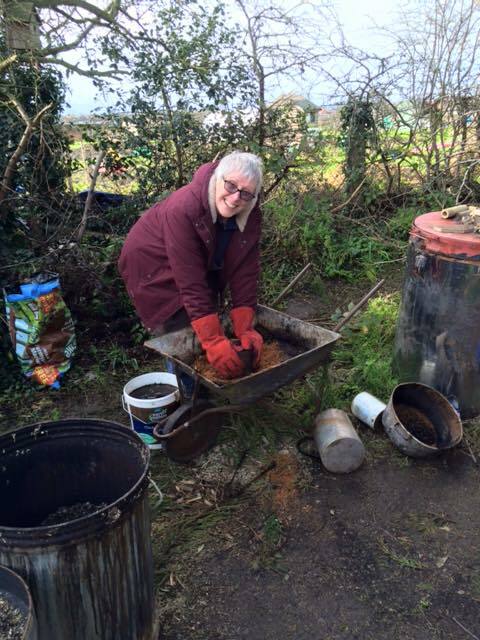 Mum doing Raku Pottery - forever crafting!